Two middle-aged men, who appear to be only glancingly familiar with each other, are up on a stage about to do something that’s both an inescapable part of everyday human experience and a doorway to the deepest form of intimacy—tapping into the power of body-to-body communication. TJ is a soft-spoken movie-industry career man, sitting ramrod straight against an upright pillow in an armchair. Wearing a plain blue sweatshirt, dark slacks, and hiking shoes, he looks slacker-casual, but he’s clearly anxious, staring wide-eyed at the man next to him as he waits to be told what to do. That man he’s deferring to is Peter Levine, the originator of a form of body psychotherapy called Somatic Experiencing (SE). Levine’s thin frame and clean-cut, tidily dressed look give him the appearance of a museum docent, rather than a man who’s leading a small legion of practitioners to refine and harness their intuition as they direct their attention to the body. With his shock of white hair, kindly avuncular eyes, and the calm way he’s nestled into his chair, we get the sense that TJ, whom he’s brought up on stage for a demonstration of SE, is in good hands. Levine starts by asking TJ why he’s come, and TJ haltingly describes how years ago, he started waking up with a painfully tight back each morning. Despite doctors, acupuncturists, chiropractors, massage, and staying active for many years, the pain just worsened over time. As TJ finishes his description, Levine, who’s been leaning back in his chair with his hands near his hips, readjusts the distance between his feet to mirror TJ’s. He brings his hands together and entwines his fingers just as TJ has done. He nods repeatedly as TJ winds down the presentation of his issues, continuing even after TJ has finished. If these two were young brothers, TJ might take this moment to snap at Levine: “Stop copying me!” But there’s a method to all the shifting around Levine is doing. 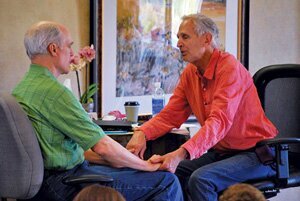 He’s attempting to enhance his nonverbal, body-to-body communication with TJ, what in SE is called achieving “resonance” between the therapist and the client. Instead of asking questions about events that might have first elicited TJ’s pain, or even about his current emotional state, Levine focuses on the body, zeroing in meticulously on what’s happening in the moment. He tells TJ that he’d noticed him end his explanation with an almost imperceptible movement—a very slight lifting and dropping of his feet and arms—and says the movement suggests his readiness to take real action to tackle his pain. It’s the sort of observation that could make a talk therapist wonder to herself, C’mon, nothing significant happened. Even if he did move a bit, isn’t it a stretch to read intention into such a tiny movement? But to Levine, minute shifts in breathing patterns or physical gestures are a big deal. Also, he’s seeing something the untrained observer likely hasn’t noticed. As he’ll tell trainees later, TJ’s color changed while he talked, and Levine divined that his pulse picked up. This belied TJ’s “restricted and still” posture, Levine says, and showed him that TJ’s autonomic nervous system was readying him to finally take action and do something different to relieve his pain. Where most of us would’ve seen nothing, Levine ferreted out a signal. As he says, “the body is trying to tell the story” behind TJ’s pain in its own way. Peter Levine is a master of tapping into the client's unspoken language. Check out this FREE video of Levine in action to see it for yourself. “Yep,” TJ says, laughing shyly at first, as if acknowledging some secret message about breathing Levine had already sent his way. Then he loudly exhales as he continues to tear up. Levine asks TJ to focus on his body’s messages by going back and forth between an image of the horse running freely and whatever sensations or feelings are arising in his body in response. When TJ reports a vague yearning, and a “lightening of the mind,” there’s more silence, but rather than feeling empty, it’s as if the two are now in their own private mind meld. After Levine gently invites him to explore how it feels to cry, TJ tells a tale of running to his mother as a young child after a friend had knocked him down in the street. Instead of comforting him, he says his mother told him to stand up for himself and fight back. Now the tears are coming faster, and TJ needs a tissue. After recalling this memory—and presumably the lasting message it gave him to redirect emotional hurt outward—TJ tells Levine he’s just felt some pain release in his back. Later, Levine will offer TJ his wrist to grasp, and ask him to empty his tension into it—an exercise that TJ says also causes something to shift inside. By the end of this session, filled with wordless moments, TJ tells Levine it’s worked—the pain that’s been his constant companion for many years has released its grip on him. Watching this play out is captivating, but also puzzling. There’s been no big dramatic moment or cathartic release. TJ says he’s better, but is he really? Has he just fallen under the spell of a transient effect brought on by the bright lights of the stage and the heightened expectations of those watching? How long will it last? It seems whatever has happened remains beyond the reach of words, or at least easy explanations. Lauren Dockett is senior writer for the Networker. This blog is excerpted from "From Margin to Mainstream" by Lauren Dockett. 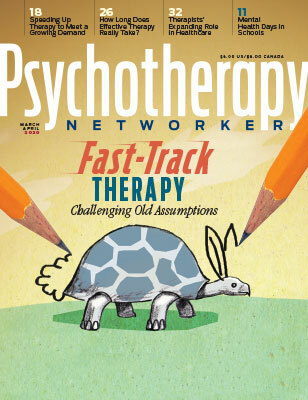 The full version is available in the March/April 2019 issue, The Missing Piece: Embracing a More Embodied Psychotherapy.